Nautical gifts by Weems and Plath, Howard Miller and Hermle. 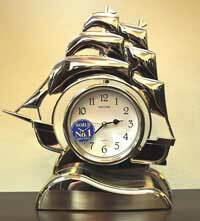 These are quality instruments for gifts, office and corporate awards or for those who enjoy the theme of nautical decor. We offer nautical decor, gifts, nautical home decor and nautical wall decor. 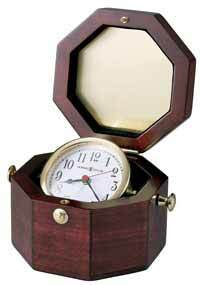 Solid wood Desktop Weather Center Clock in a mahogany finish. Glass panel with beveled top. 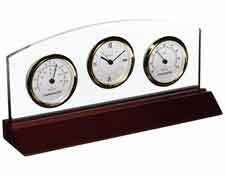 Includes clock, thermometer with Fahrenheit and Celsius scales, and hygrometer. Polished goldtone bezels and clear protective lenses over each dial. 8” x 1” engraving plate is included. One year warranty and Free Shipping. Size: Height 4.75 Width 10" Depth 2". 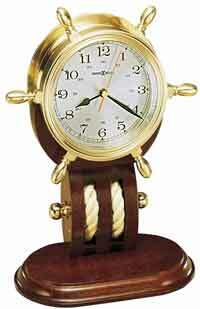 The Mariner weather clock has a wood and veneer panel in a walnut finish for a contemporary appearance. 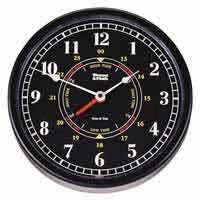 The Spun aluminum dial, bezel and instrument housings make the clock distinctive in any room. A clock and thermometer with Fahrenheit and Celsius scales give you accurate time and temperature readings any time of day. 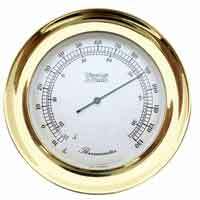 Hygrometer for up to the minute humidity readings in your room. Raised protective glass lens adds distinction and durability to this weather clock. Quartz analog movement for a long lasting on time performance. One year warranty and Free Shipping. Size: Height 14.5" Width 7" Depth 1.75". Beautifully lined in velvet and features polished brass feet, push-button catch, and angle adjustment knobs. The gimbaled white dial will tilt to the angle of your choice and features black numerals and hands. Finished in a high polished Rosewood Hall on select hardwoods. Quartz movement includes battery. One year warranty and Free Shipping. 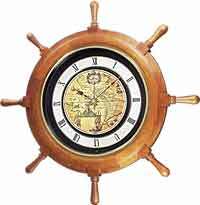 Size: H. 4-1/4" W. 6-1/4" D. 5"
Polished and lacquered solid brass ship's wheel clock rests on a mahogany base which features nautical rope and brass knob detailing. Spun silver tone Arabic numeral dial and 24-hour time track. Beveled glass crystal. Brass self-adhesive engraveable plate with polished beveled edges. Quartz, battery operated movement. One year warranty and Free Shpping. The Howard Miller Endeavor 645-743 is a hinged clock and compass combination with a black piano finish on select hardwoods and veneers. The white dial includes black bar hour markers; Roman numerals at the 12, 3, 6 and 9 positions; and an inner minute track. The dial is surrounded by a polished silver-tone bezel and features black hour and minute hands and silver second hand beneath a glass crystal. The compass includes black decorative compass rose graphics. Folds for easy storage and transport. A full felt bottom protects your desk or table top. Quartz movement includes battery. One year warranty and Free Shipping. 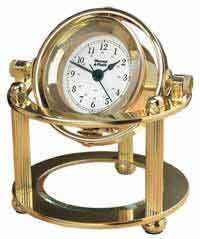 Size: Open: H. 4.5" W. 3.5" D. 5.25"
Closed: H. 1.75" , W. 3.5" D. 4"
A polished goldtone gimbaled captains clock is housed in a felt lined octagonal chest. 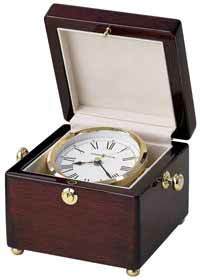 A push button catch will open the lid to reveal the white dial with black Roman numerals and hands with a brass second hand. A felt bottom protects your desk or tabletop. A brass octagon plate covers the inside top. Quartz movement includes battery. Finished in Windsor Cherry on select hardwoods and veneers. Size: H. 3-1/2" W. 6-1/2" D. 5"
The Howard Miller Westport 645-680. 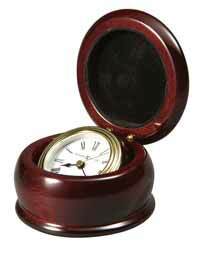 This gimbaled clock tilts for easy viewing and is housed in a high-gloss Rosewood Hall finished.Maritime style round box with felt-lined lid and felt bottom. 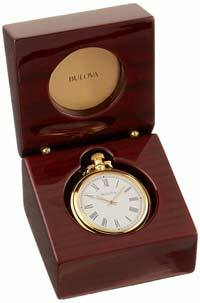 A polished gold-tone, waterfall style bezel surrounds the white dial beneath a glass crystal. 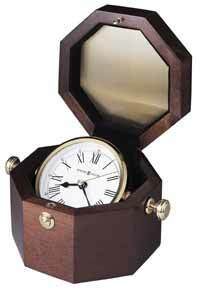 Features black Roman numerals, black hour and minute hands and a gold-tone seconds hand. Accurate Quartz battery operated movement. Finished in Rosewood Hall on select hardwoods. Size: H. 2-1/2" W. 3-3/4" D. 3-3/4"
Solid hardwood presentation box, high gloss piano finish over mahogany stain. Removable pocket watch and chain with engravable back. Clear protective lens. 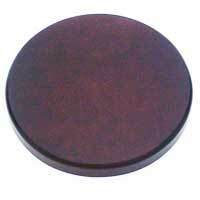 1.75" round engraving plate included for presentation box personalization. Requires: (1) SR626SW battery, included. 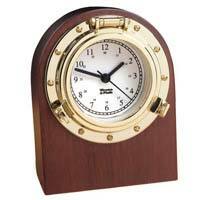 Rhythm 4RP705R18 Sailng Ship clock with moving sails. 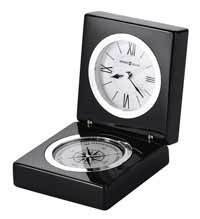 This quartz, battery operated clock offers a swinging sail on the top of the clock that will rock back and forth. Goldtone plastic case and sail prevents tarnishing. Clock operates on 1 "C" battery. One year warranty and Free Shipping.